Weights and Measures: Flickr vs. Photobucket | No Soap, Radio! 1) Webshots has no capital S. Never has, never will. 2) High resolution images are availble to free members on Webshots. 3) Tim O’Reilly has already touted Ofoto vs. Flickr as a classic Web2.0 case. Aside from the many debates about the meaning of Web2.0, it is a stretch to consider Webshots a Web1.0 company for numerous reasons. Webshots was the pioneer of a public photoblogging on a grand scale and has afforded millions of people the opportunity to quickly become involved in community and discussion around photos for many years. The business was sold a second time because of its very very long tail. – In Q2, Yahoo bought three companies: the total estimated purchase price for all three was about $37 million and consisted of $32 million in cash consideration, $3 million related to stock options exchanged, and $2 million of incurred liabilities and direct transaction costs. That price includes the three publicly announced buyouts I could find: Flickr, DialPad, and Stadeon. 5) As far as addiction or passion for products, Webshots has always had zealots–from people desperate to see the newest Daily Photo just after midnight, to college kids obsessing on Facebook and Webshots. There are more poignant examples like many infirm individuals who have written in over the years to let the company know that Webshots gets them through each day. With those out of the way, I’ll get to the heart of the matter, Flickr’s Alexa growth. It has been fast and steady and has now pulled into the same order of magnitude as Webshots which is indeed a fantastic achievement. That growth has nothing to do with Web2.0. It is a pure market demand to have your photos hosted and served. 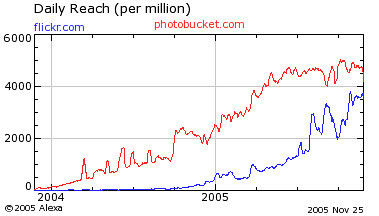 Have a look at Photobucket (not exactly Web2.0) which I believe also tops Nielsen NetRatings in the photo category. They store your photos and let you post them on your blog/site/whatever. When it comes to ratings, all these lists and charts are unfortunately only minor gauges. They all have flaws and are prone to wild swings. In fact, the leading metric by influential industry analysts (e.g. Infotrends, Future Image) remains the number of prints ordered primarily because that has a direct tie to revenue generated. In that domain, Webshots is a small player and Flickr is non-existent. Kodak and Shutterfly do lots of volume and generate revenue in the $50-100M range. Webshots fought a hard battle legitimizing the media model and exposing the all-digital photo sharing behavior as a model for the future. Is there money in online photo sharing? Webshots is a hybrid but under the CNET umbrella has been committed to building branded advertising. Photobucket (ostensibly the industry reach leader) is going slow and steady with an incremental paid service. If they have their math right, then they are building a long-term solid business but ultimately not all that big (because of free alternatives). In a culture known for merit based on revenue and margins, Yahoo! Photos has flip-flopped on whether to charge for the service and has now added Flickr with its odd hybrid (some adwords and a basically “good will” pay-for service). As long as Flickr’s growth remains financially manageable, then Yahoo! can continue to enjoy the halo and gobs of press which has substantial if intangible value. Digital photos and photo sharing are becoming essential communication touch points in every day life. There will continue to be many large players in this market because there are such diverse segments of people doing things with photos. Heck (in the did you know category) eBay probably gets more photos uploaded each day than Webshots and Flickr combined! There are lots of new players emerging too. Riya may have taken a step forward in facial recognition. Other sites like Zoto and BubbleShare are showing off ajax and speedy applications. OK, I have to get back to our little calendar project. Anyone out there interested in beta testing (ideally in January), please sign up at 30 Boxes. I think your points are good ones, and your clarifications are necessary as well. Photobucket is showing growth too — although i think its business model is more Web 2.0 than you give it credit for. Just because it doesn’t use Ajax doesn’t mean it isn’t Web 2.0 (whatever that really is). I’m also not sure that using photos printed as a measure of a successful photo site is terribly relevant. It may be the easiest way to measure, but that doesn’t make it the best. Studies have already shown that only a tiny fraction of digital photo and photo-site users ever print their photos. In any case, I think the things that make Flickr different from Webshots — use (or better use) of things such as tags, groups, RSS feeds, and so on — are still instructive, and I believe (although I can’t prove) that they have contributed to the growth of the site vs. Webshots. my comments: my general interpretation of open API’s is that they are an affiliate program and can have limited impact on driving traffic. Webshots has employed “keywords” for years and extensive commenting. Flickr’s innovations around tags and groups are nice, but my basic premise remains: they offered a robust product with a clean (no ads) interface and generated a lot of word of mouth and were happy to host photos for blogs (something livejournal and others stayed away from because of the cost structure). Flickr built a great product and generated heaps of PR, they never created a full-fledged business because Yahoo bought them before big cost issues set in. “Flickrâ€™s innovations around tags and groups are nice, but my basic premise remains: they offered a robust product with a clean (no ads) interface and generated a lot of word of mouth and were happy to host photos for blogs (something livejournal and others stayed away from because of the cost structure). Flickr built a great product and generated heaps of PR, they never created a full-fledged business because Yahoo bought them before big cost issues set in.” Narendra, I think you are right on here. Flickr is fortunate though to have found in Yahoo! a deep pocket partner who can subsidize the bandwidth expense while benefiting corporate-wise from the growing attention (PR) and user base. Of course even greater than Flickr’s photosharing business in and of itself, Yahoo! stands to benefit by leveraging the social community that is Flickr and using it (initially) to improve their image search (interestingness) and eventually to more seriously integrate social networking into web search overall. A gamble on Yahoo!’s part and back to the monetization of eyeballs, but I think it will work for them. Flickr stays mean and lean from a staffing standpoint which of course also helps them. Should be interesting to watch it unfold. Alexa traffic isn’t a true gauge, as it’s internet traffic and our images are not that large, and again, Alexa is tracking traffic off of our domain, not all the images being linked out into the web. If it were, our numbers would be in the stratosphere. The fact is we aren’t competitors to Flickr. We are not a destination site, or a community. We are just a very reliable, very fast, and easy to use utility for all the bloggers, social networking, discussion forums, and just web sharing needs users have. We serve out over 1.5 billion images a day, and are uploading over 6 million new images. We have over 11 million users and are quietly growing at well over 1 million a month. We are completely agnostic, and will continue to innovate at Photobucket for new ways to share media on the web. Wait till we show you what we have coming in the next few weeks. I think it’ll make a pretty big impact on the space. Good luck with everything, and please drop me a line.